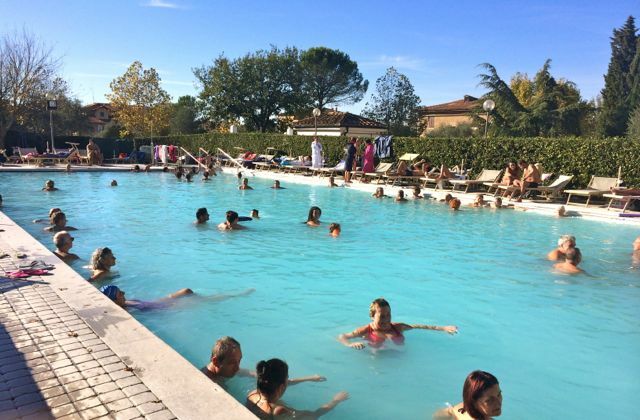 Rapolano Terme is just off the super strada that runs between Lake Trasimeno and Siena. There are two spas there that use the water from hot springs. If you are going out for the day towards Siena from pretty much all of our rental properties you will pass Rapolano Terme. We always go to the spa called the Antica Querciollaia and it makes for a very pleasant couple of hours. Make sure you take some flip-flops, a bathrobe (if you have one), a swimming costume (obviously) and a towel. There are pools indoors and out and the temperature varies in each. If you are going there as a stop on a day out, bear in mind that the price drops after 15:00 (3pm). I can’t find the prices on the website but it’s around €15 full price and something like €12 after 3pm.